USI was in attendance today during the ribbon cutting ceremony and dedication for Christ’s Haven Cottage 17. We are honored to support Christ’s Haven’s mission and ministry in a small way. Dale Cox, branch manager for USI Champion Insulation in Dallas / Fort Worth, TX, was there along with Paul Holmes, the Mid-South and Canada Regional Manager for Accella Polyurethane Systems. Accella was kind enough to donate the majority of the open cell foam for this project. 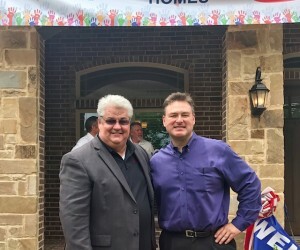 There were approximately 70 individuals in attendance, including builders and management from First Texas Homes, HistoryMaker Homes, Bloomfield Homes and Gehan Homes. The event was hosted by Skyline Home Loans and BBQ was served. It was filmed and will be a topic on the Texas Top Homes radio show and website. Christ’s Haven has provided a safe environment for children in the Fort Worth area for over 60 years. Christ’s Haven has over 100 acres with now 17 cottages to house staff and children. The organization provides love and support to children and families in need of healing from past trauma and allows the families to envision a brighter future together. Please visit ChristsHaven.org for more information.